Self-blame, shame, and self-condemnation plague many people and keep them from living lives of freedom and abundance. If you are haunted by the pain of your mistakes and shortcomings, Moving Forward offers you a way to break free from the ghosts of your past. Learn the six steps to forgiving yourself and ending your struggle with self-blame forever. I'm Everett Worthington, a Professor of Psychology at Virginia Commonwealth University. I am also a licensed Clinical Psychologist in Virginia. Although I've published about 30 books and over 300 articles and scholarly chapters, mostly on forgiveness, marriage and family topics, and religion and spirituality, I'm the most excited about my newest book (released in mid-July 2013). It is called Moving Forward: Six Steps to Forgiving Yourself and Breaking Free from the Past. Through my counseling and my personal experiences, I have found that many people are plagued by shame and self-blame. In Moving Forward, I tell how I struggled with self-condemnation after my brother's suicide, and how I moved through struggles with my faith and on to freedom from that self-condemnation. The research my colleagues and I are doing now shows how people can work through the six steps to forgiving themselves and experience freedom. I am excited to share this with you. To see excerpts from the book, start at the Prologue. Coming soon! We just completed a study of the effectiveness of a 6-hour individual workbook to help people forgive themselves. 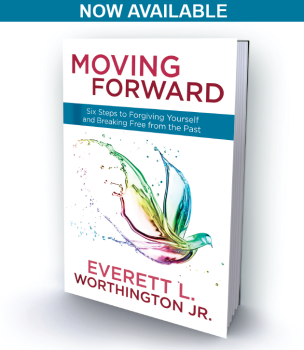 We intend to give this away—free!—as we do the resources to forgive someone else (see www.EvWorthington-forgiveness.com). But, before we offer the resources free, we always insure that our studies are vetted in scientific journals by peer review. Once our study on the self-forgiveness workbook has been accepted by a masked review editorial process, we will post that free workbook here—for you. For now, please enjoy all the information on this website, and if you want more, please purchase Moving Forward.